Amazon.com Price: $13.25 (as of 2019-04-22 02:24:44 GMT) Product prices and availability are accurate as of the date/time indicated and are subject to change. Any price and availability information displayed on Amazon.com at the time of purchase will apply to the purchase of this product. 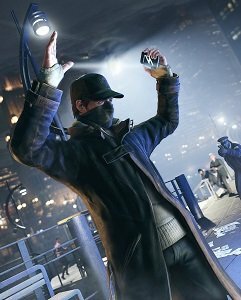 In Watch_Dogs, this system is called the Central Operating System (ctOS) and it controls almost every piece of the city’s technology and holds key information on all of the city’s residents. Control the city’s infrastructure, in real time, with Aiden’s cell phone. Trap your enemy in a 30-car pileup by manipulating the traffic lights. Stop a train, and then board it to evade the authorities. Narrowly escape capture by quickly raising a drawbridge. Anything connected to the city’s ctOS can become your weapon. Discover a new level of interaction, cooperation and confrontation between players thanks to a brand new multiplayer game system that links the single and multiplayer modes into one seamless experience. That means no menus, no loading screens, just instant open world multiplayer action. Go beyond the console with a ground-breaking, real-time, companion game. This innovative mobile platform allows players to connect and compete with friends, even when away from the home console. 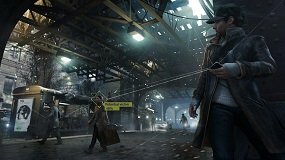 The Watch_Dogs companion game delivers revolutionary dual-screen gameplay that enables you to play from anywhere, at any time. Create your own way to attack. Take down enemies by delivering devastating blows with your baton, or use combination of shooting and hacking to gain advantage in a situation. Overall, you will have access to more than 30 weapons that rival any shooter. Get behind the wheel of more than 65 vehicles bursting with horsepower to explore the massive city while completing missions. Ubisoft Montreal partnered with Ubisoft Reflections, the acclaimed studio behind the award-winning Driver series to develop each vehicle with state-of-art physics and handling. 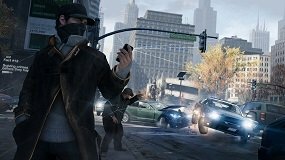 Experience the advanced processing and graphics capabilities of Disrupt, the all-new game engine dedicated to Watch_Dogs. The engine delivers stunning visuals and an incredibly realistic experience. Disrupt gives you the power to affect the story, the city and the life of the population with your choices, creating a ripple effect throughout the city. HACK THE CITY: Control the city’s infrastructure, in real time, with Aiden’s cell phone. Trap your enemy in a 30-car pileup by manipulating the traffic lights. Stop a train, and then board it to evade the authorities. Narrowly escape capture by quickly raising a drawbridge. Anything connected to the city’s CTOS can become your weapon. SEAMLESS MULTIPLAYER EXPERIENCE: Discover a new level of interaction, cooperation and confrontation between players thanks to a brand new multiplayer game system that links the single and multiplayer modes into one seamless experience. That means no menus, no loading screens, just instant open world multiplayer action. HIGH OCTANE DRIVING: Get behind the wheel of more than 65 vehicles bursting with horsepower to explore the massive city while completing missions. Ubisoft Montreal partnered with Ubisoft Reflections, the acclaimed studio behind the award-winning Driver series to develop each vehicle with state-of-art physics and handling.